Sri Tirukkatikai Yoga Anjaneya Swamy Temple : The Small Mountain (Chinna Malai) is about 200 feet where lord Anjaneya is found in sitting position found along with Sangu and Chakkaram in west facing direction. Here, Sri Vishnu gave His dharshan to Anjaneyar. Aanjaneyar is considered to be the resemblence (or) Avathaar of Shiva, but here he is resembling the avathar of Sri Vishnu. Hanuman has four arms (chatusbuja) with a Sanka and Chakra in two arms. Here Hamuman is known as Yoga Anjaneya. HE is also seated in a yogic posture with a Jap Mala and Jap Sanka and meditating upon Lord Narasimhan.Lord Rama Patabisheka is engraved on his Krida (crown) of Hanuman. Lord Hanuman here protects devotees and grants them various boons. 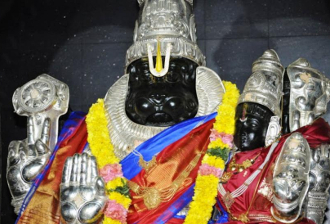 Nowhere else in India is Lord Hanuman seen with Sanka and Chakra given by Lord Narasimha himself to protect the devotees. Hence, a visit to this temple will definitely ensure devotees a prosperous life.